Everyday I still reminisce the times when I went to Taiwan years ago, doing shopping at their famous night markets in Shih Lin, eating tons of street food and enjoying the weather. After a day of shopping, I always make sure to have some take out to bring to the hotel to munch before I say my goodnight prayers. No. 1 on my list, Chicken chops! Since then, I have been craving for chicken chops from Taiwan. The ever so crispy and juicy chicken breast, battered to perfection and seasoned to taste, fried to a crisp and tender to the bite. Then after years of searching and wanting to satisfy the crave for chicken chops, I stumbled upon Big Daddy's Chicken, and this made me smile like I was a kid again. Oh yes! Big Daddy's chicken chops... just like the ones I had in Taiwan, wonderful!! and I mean smoking hot. which adds that extra kick to the chicken. Then chopped to fine pieces, good enough to munch on. Another tasteful addition to their menu is the Spiral Potatoes at P 50. Taiwan's Famous Chicken Chop is now in Manila! Great tasting chicken will surely travels miles to delight lovers of fine good food. Finally, the crispiest, juiciest chicken that Taiwanese and Singaporeans are going gaga over – is now in town. Big Daddy’s Chicken is all about flavor and frying perfection. It gives justification to the saying “crispy on the outside, juicy on the inside” with its fresh-from-the-pan serving style. The large crispy chicken chops are selected using very strict standards and served without the skin and chicken fat. Each piece is then soaked in special sauce before frying and uniquely flavored with all-natural aromatic spices that make every bite simply heavenly and addicting. Customers can have their Asian-style fried chicken in Original, Chili, Lemon, Nori or Plum Flavor which adds that extra kick to the chicken. Bite your way to the famous Chicken Chop for a fairly good price of P80 a piece. Big Daddy’s Chicken is located at Greenhills Theater Mall and also at the newly opened store at the G/F Entertainment Mall of SM Mall of Asia. 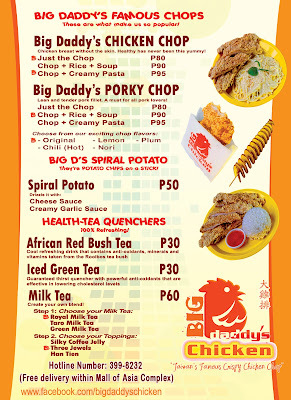 Big Daddy’s Chicken is also accepting bulk orders for parties and events throughout Metro Manila. Just call Hotline 345-8232. 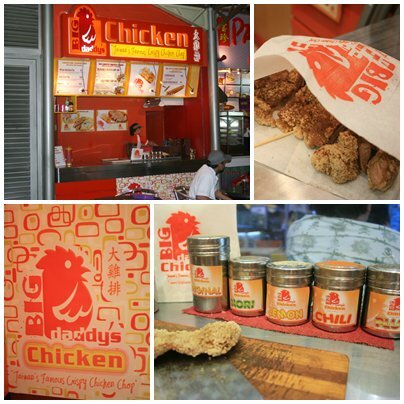 For more info and for franchise inquiries, contact Jerry Perez Jr. or Kimberly Ting at 0917-792-4850 or send an email to inquiry@bigdaddychicken.com.